I’ve always loved potatoes. 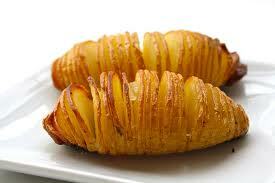 But when I discovered Hasselback potatoes, I fell in love all over again. 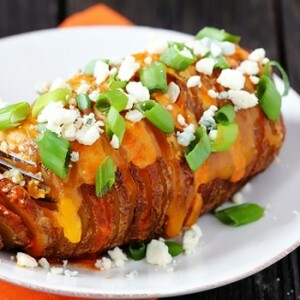 Hasselback potatoes – also called accordion potatoes – originated in Sweden. Named for the Restaurant Hasselbacken, there are numerous variations of the basic recipe. (If you’ve never had them, check out my basic recipe here.) What I love about them is they’re crispy on the outside, and soft on the inside, and flavorful inside and out. 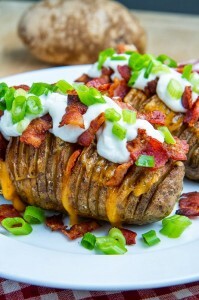 Just thinking about this makes me want to run to the store for some super-sized spuds! Now, Americans can’t leave anything alone. They just have to play with it (a good thing!) and come up with their own take on foreign recipes. That’s how we got pizza. That’s how we got chili with beans. 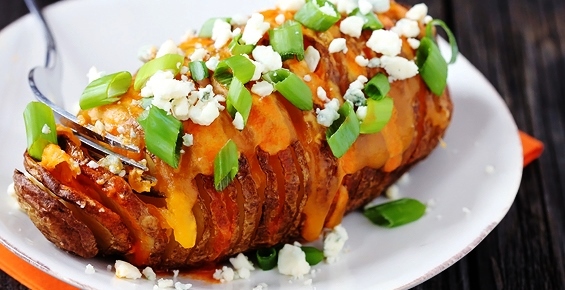 And that’s how we get Buffalo Hasselback potatoes. Obviously, there are many variations out there. My version is fairly basic, but can easily be heated up, as you’ll see below. So let’s go have some fun! With a vegetable brush, scrub your potatoes under running water. Pat dry. 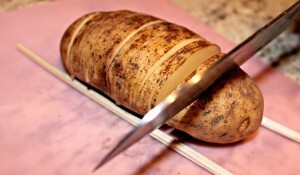 Cut a thin slice off the bottom of each potato so that it won’t wobble as you slice them. It’s important that the potato remains stable while working with it. The easiest way to cut almost to the bottom of the potato, but not completely through it, is to place a chop stick, skewer, wooden spoon or dowel to either side of the potato. Then you just slice until you hit wood. 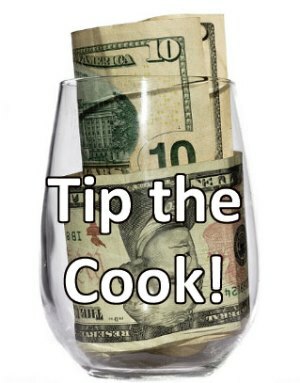 Make your slices about 1/4″ thick, and slice from one end to the other. Place potatoes on foil-lined baking sheet. Bake on center rack for 60-70 minutes (for one pound potatoes). About every twenty minutes, pull the potatoes out of the oven (and close the oven) and brush them with olive oil. If there’s some in the bottom of the pan, use that. If not, drizzle a bit more over the tops. Back into the ovent hey go for another twenty minutes, until you do it again. The potatoes are done when the centers are cooked through, and soft, and the edges are crispy and look a little wilted. IUse dowels or something similar to cut uniform slices. Once you have the potatoes in the oven, heat a tablespoon or two of butter in a small pot over medium heat. Once melted, add the Buffalo wing sauce. Once it starts to simmer, reduce heat to just keep warm. When potatoes are done, remove from oven (and close the door!) Drizzle a little, or a lot!, of the wing sauce and butter over the potatoes, then put a good portion of shredded cheese over each. Then pour more wing sauce over the cheese. Return to oven for just a minute or two to melt cheese. Remove from oven for the last time (and turn the oven off). Sprinkle just a bit more cheese over each potato, then drizzle a little more sauce. Sprinkle with a generous portion of Blue cheese and a final slight drizzle of sauce. Sprinkle green onions as the final garnish and serve immediately. A properly cooked Hasselback potato. Notice how the slits have opened? Let’s talk about the size of your potatoes. If this is going to be the main part of a meal or snack, you’ll probably want to use really big potatoes, say a pound or more each. If, however, this is a side dish, you’ll want to use smaller potatoes, 1/2 pound. You could even do baby potatoes as appetizers or munchies. Size matters here because larger potatoes take longer to cook. 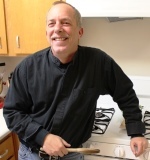 If your cooking medium potatoes, check them at fifteen minutes and baste, then again at thirty minutes. I suggest 10 minute intervals for babies. Once you’ve done it a few times with a particular size, you’ll get a feel for how long it takes in your oven. I usually look for big ol’ russet potatoes, but any variety and/or color will work. Go with what moves you and have fun! Pair the potatoes with a good salad of field greens with tomato, cucumber, and other fresh veggies, and maybe some carrot and celery sticks to make an excellent meat-free meal that’s still Very Manly. If you’re looking to make it more filling, or just want to be carnivore, you can add shredded or chopped grilled chicken and/or crumbled bacon to add some meat to the mix. If you don’t have crumbled Blue cheese, you can substitute a good Blue cheese salad dressing. Also, if you’re going the dressing route, you can use Ranch dressing for a different taste. I stick with Blue cheese myself, and if I do a salad dressing, it’s in addition to the crumbles, and it’s always a thick one. I’ve also seen folks add sour cream, either a dollop on top, or some on the side. This is a good touch for those who may want to cool the heat down a bit and give their mouth a break. Here’s my basic Hasselback Potatoes recipe with a few variations.